Will this be the last election? I can’t say for certain that Jones is wrong or exaggerating. Instinct tells me that he may be right about this. Comey knows he’s covered up crimes, he’s discredited. The stuff coming out this week is head spinning. When they win by stealing it, they expect an uprising by everyone else calling foul. They will claim that it;s impossible to lead America with the division in the country and will enact forceful planning, martial law, etc. They’ve been looking for the triggering mechanism and it’s here. The real egg is in the Wikileaks but we cannot drop the ball on voter fraud. On Sunday night, Wikileaks enigmatically tweeted that it would launch “phase 3 of [its] US election coverage" in the coming week. The site put politicians on notice Sunday evening in a tweet that also included a plea for donations. “We commence phase 3 of our US election coverage next week. You can contribute: https://shop.wikileaks.org/donate @WLTaskForce" the whistleblower website announced moments ago. As the Hill noted, Wiki did not provide information about what the third phase entails or if there are still more revelations to come. 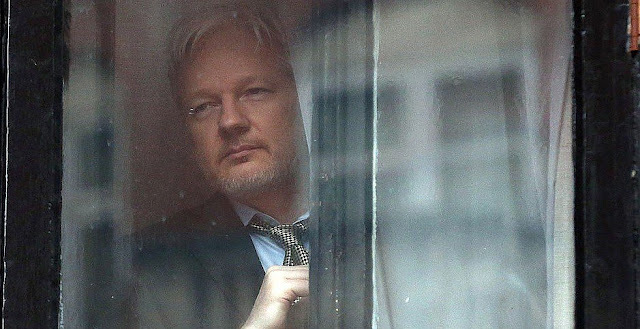 As a reminder, Wikileaks' founder Julian Assange currently finds himself in the Ecuador embassy where his internet access has been revoked for the duration of the presidential campaign to avoid the appearance of intervention. Wikileaks supporters, now including a number of disgruntled GOP nominee Donald Trump and Bernie Sanders supporters, promptly replied with tweets expressing hope that phase three would ultimately damage Democratic presidential nominee Hillary Clinton's campaign. User “CorruptMedia” responded with a Photoshopped estimating what CNN coverage of Clinton being escorted to jail would look like. A new archive of Clinton-related documents would further irk a campaign still reeling from FBI director James Comey's announcement on Friday that new emails related to the Clinton server probe had been discovered. 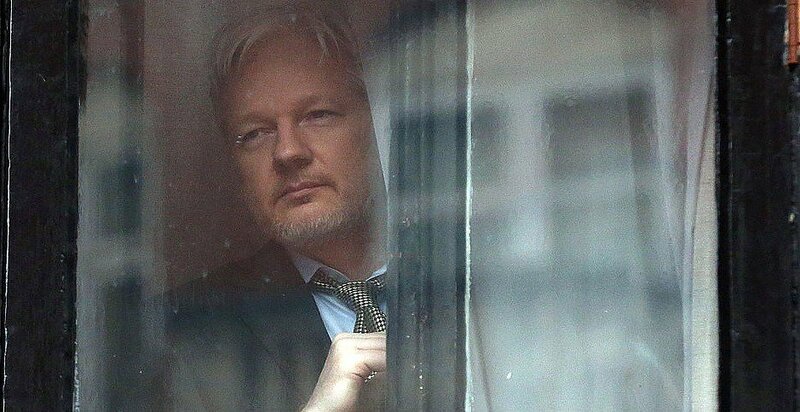 Wikileaks has already posted hacked emails from the Democratic National Committee and Clinton campaign chief John Podesta: the former led to the resignation of former DNC chair Debbie Wasserman-Schultz after it was revealed that the DNC was actively scheming to prevent Bernie Sanders' nomination; the former has led to a series of dramatic revelations into the strategic operations of the Clinton campaign, with the most damaging emails exposing the Clinton Foundation and WJC's consulting outfit Teneo as an "influence-peddling" pay-to-play organization as noted in "Doug Band To John Podesta: "If This Story Gets Out, We Are Screwed""
The FBI has reportedly obtained a warrant to dig through hundreds of thousands of newly-discovered emails allegedly related to a private server used by Hillary Clinton. It’s unclear if the renewed probe will achieve any results before US Election Day. The search warrant allows the bureau to scour through some 650,000 emails discovered on a laptop belonging to ex-Congressman Anthony Weiner and apparently also used by his wife, Clinton’s closest aide Huma Abedin. The probe is set to check if any of the texts are related to the reopened investigation of the former secretary of state’s private email use. The authorization came two days after FBI Director James Comey finally revealed the existence of the emails stash which was reportedly discovered by the agency in early October. “The process has begun,” a federal law enforcement official told the New York Times. The new emails were discovered as part of a separate ‘sexting’ probe into former Representative Anthony Weiner (D-New York). His electronic devices were seized during that investigation. Abedin claims she has no knowledge of any of her emails being on the electronic device belonging to her husband, CBS News haslearned on Sunday. A source told the network that newly-discovered emails belonged to Weiner, not his wife, who left her husband earlier this year over his sexting addiction. Clinton's longtime aide is allegedly cooperating with the investigation and “seemed surprised that the emails were there,” according to the CBS source. On Friday, FBI Director Comey announced that due to new findings, the criminal investigation into Hillary Clinton’s private email server had been reopened, as he sent a letter notifying Congress of the email review. The review, which is likely to take weeks, will seek to determine whether any of those messages are work-related, and whether they include either classified information or important new evidence in the probe aimed to check whether Clinton’s actions undermined US national security. The unexpected announcement came just over a week before Americans head to the polls to determine the winner in the race for the White House between Democrat Clinton and Republican Donald Trump. Even though some of those emails passed through Clinton’s private server and could be duplicates of the information already handled by the FBI as part of the previous investigation, the probe is unlikely to wrap up before November 8. Concerned by the FBI’s move to relaunch the investigation so close to the election date, US Senate Democratic leader Harry Reid on Sunday sent a letter to the FBI director hinting that Comey had violated the Hatch Act, which bars the use of an executive branch position to influence an election. “Through your partisan actions, you may have broken the law,” Reid, a senator from Nevada, said in the letter to Comey. Clinton campaign chairman John Podesta and campaign manager Robby Mook also questioned the legality of the FBI’s actions. Comey’s letter to Congress was “long on innuendo, short on facts,”Podesta told CNN's State of the Union. “We are calling on Mr. Comey to come forward and explain what’s at issue here,” Podesta said, adding the significance of the emails was unclear. In the meantime, the NYT reported that senior Justice Department officials vowed to make all resources available to conduct the investigation as quickly as possible. In July the FBI’s long investigation of Clinton’s private email use during her time as secretary of state ended without any charges. register as an agent of a foreign entity. The FBI field office in New York had done the most work on the Clinton Foundation case and received help from the FBI field office in Little Rock, the people familiar with the matter said. Some said that is because the FBI didn’t present compelling evidence to justify more aggressive pursuit of the Clinton Foundation, and that the career public integrity prosecutors in the room simply believed it wasn’t a very strong case.Others said that from the start, the Justice Department officials were stern, icy and dismissive of the case. “That was one of the weirdest meetings I’ve ever been to,”one participant told others afterward, according to people familiar with the matter. Needless to say, the probe into the Foundation aded. There are signs that the race for the White House is tightening amid continuing fall-out from the 11th-hour announcement by FBI director James Comey that he was assessing new emails potentially related to the use of a private email server by Hillary Clinton while Secretary of State. Most notable were two new polls showing that her Republican rival, Donald Trump, may be finding a way back into the contest by becoming newly competitive in Florida, a key state with a large trove of Electoral College votes, without which he would have no plausible path to victory. Additionally, a new Washington Post/ABC poll showed Ms Clinton leading Mr Trump by a perilously close two points nationally in a four-way race including Green Jill Stein and Libertarian Gary Johnson at 47 per cent versus 45 per cent, which is inside the margin of error. The same poll had Ms Clinton enjoying a huge 12-point lead just six days earlier. All the new polls were conducted before Friday when Mr Comey dropped his new emails bomb, the precise impact of which remains uncertain. However, the anxiety it has created in Ms Clinton’s circle is tangible as one after another of her allies called on Mr Comey to clear up the confusion over what the new emails may or may not contain. Their existence came to light in a brief letter sent by Mr Comey on Friday to leading members of Congress. It was extremely scant on detail, saying nothing beyond the fact that they may be “pertinent” to the investigation into her email server which the FBI formally concluded in July. While it is now known that the new emails were found in devices shared by Huma Abedin, one of Ms Clinton’s closest aides, and her husband, from whom she is estranged, Anthony Weiner, there has been nothing more from Mr Comey on why they may be of interest. It even appears that many may be duplicates of emails the FBI has already analysed. 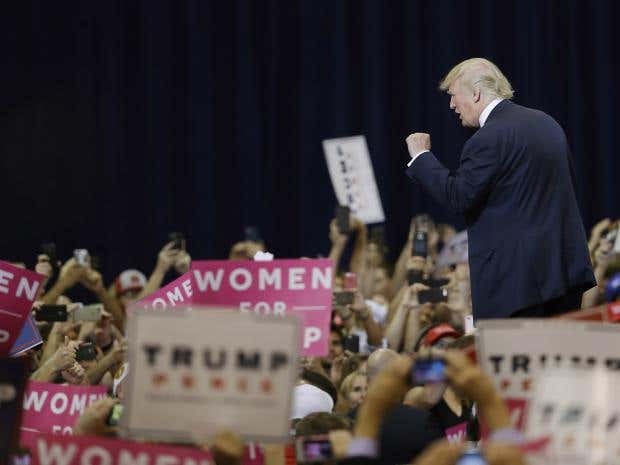 "We never thought we were going to say thank you to Anthony Weiner," Mr Trump declared at a rally in Las Vegas on Sunday, virtually taunting the Clinton campaign on the issue. "Corruption is corrosive to the soul of a Democracy, and it must be stopped. We have one ultimate check on Hillary’s corruption, and that is the power of voting. The only way to beat the corruption is to show up and vote by the tens of millions, including millions of people voting for the first time in their entire lives." Adding to Democrat frustration has been confirmation that before he sent the letter, Mr Comey was strenuously advised to desist by the Justice Department which argued it would violate long-existing groundrules about not doing anything close to an election that could change its course. 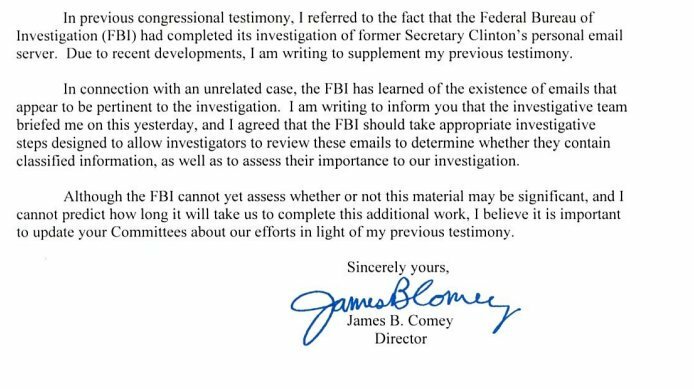 It seems that Mr Comey may not even have seen the emails in question. In a subsequent email message to FBI employers on Friday, he said, “we don’t know the significance of this newly discovered collection of emails”. Meanwhile, if he does decide to re-open his investigation, any new findings may not emerge until after election day. Ms Clinton's campaign chairman, John Podesta, said the director’s handling of the matter was “inappropriate”. He also urged Mr Comey to be more transparent because the disclosure came “in the middle of the presidential campaign so close to the voting”. Late on Saturday, meanwhile, a group of four Democratic senators – Patrick Leahy of Vermont, Dianne Feinstein of California, Thomas Carper of Delaware and Benjamin Cardin of Maryland – wrote to Mr Comey and Attorney General Loretta Lynch demanding a full explanation of the FBI’s actions by Monday at the latest. “We request you provide us with more detailed information about the investigative steps being taken, the number of emails involved, and what is being done to determine how many of the emails are duplicative of those already reviewed by the FBI,” they wrote. The first sign of Mr Trump closing the gap with his Democratic rival in the Sunshine State came in the middle of last week, when a Bloomberg News poll gave him his first lead there for several weeks. Sunday also saw the release of an NBC News/Wall Street Journal/Marist poll that had them essentially tied in Florida with Ms Clinton at 45 per cent and Mr Trump at 44 per cent. Ms Clinton was in Miami this weekend. On Saturday night she joined Jennifer Lopez on stage at a concert held in support of her campaign and on Sunday she visited a Miami restaurant to urge Democrats to vote early. As patrons ate Sunday brunch, she said she wanted to get them “fuelled up” to head directly to early voting stations and cast their ballots. Hillary Asks Ex-Prosecutors "to Hit FBI Director James Comey"
Is Trump heading for a landslide? Asylum sought at Russian consulate in NY? Is Russia appeasing the Americans?